Very nice... the second version is certainly better, the first one has a strong outline that is more comic pakset-ish. It does look really nice - the level of detail is very impressive. I definetely agree, but wasn't there once a policy of not having military/nuclear related stuff in official pakset releases? 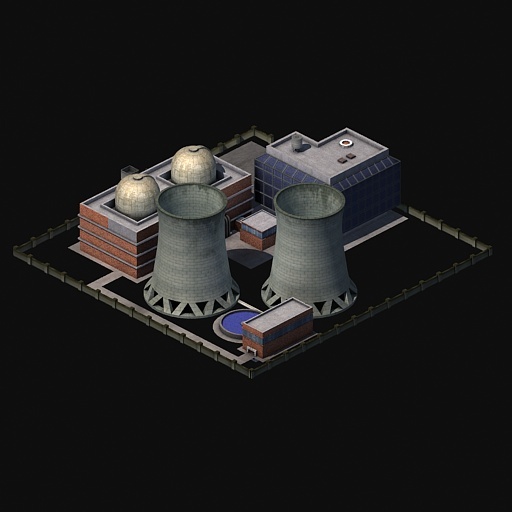 Personally I don't really see any sense in sensoring nuclear power and I think it would be a nice addition. I definetely agree, but wasn't there once a policy of not having military/nuclear related stuff in official pakset releases? Indeed but I don't see the point of such policies. 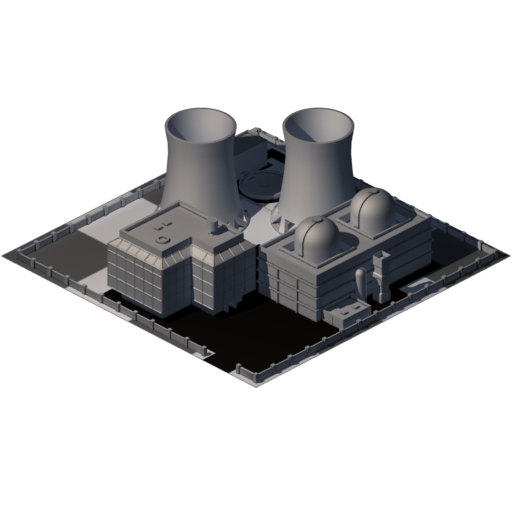 If someone complains, we will see, until there I'm okay with adding a nuclear power plant to the pak, especially that it is an important piece for realism. For instance, in France, barely 85% of energy comes from nuclear power plants. Well not only that but even though nuclear power's history is stained by several catastrophes (three mile island, chernobyl and now fukushima) it is more and more seen as one of the few feasible alternatives mankind has if we to manage global warming. What to do with the waste still is a problem though, but new methods are showing up such as trapping it in glass for instance. Many environmentalists such as James Lovelock are endorsing nuclear power. - if only power plants could produce waste. I'd include that nuclear waste-glass manufacturing as part of the chain. 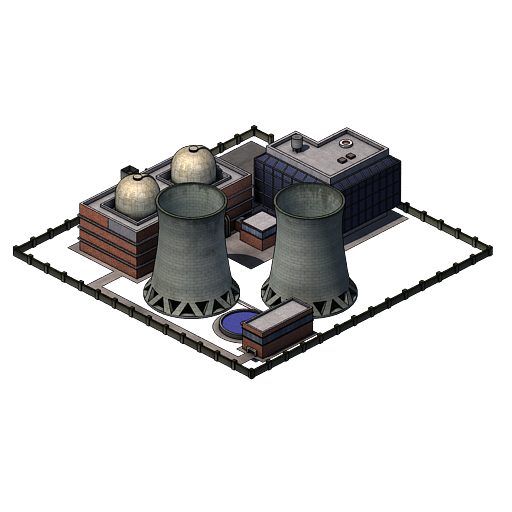 The amount of waste it would produce in the game would be very small... and many power plants just store it on site for lack of a good place to put it. That's true, and a single recycling plant or repository site could potentially serve dozens of power plants. But it would give a very nice touch. 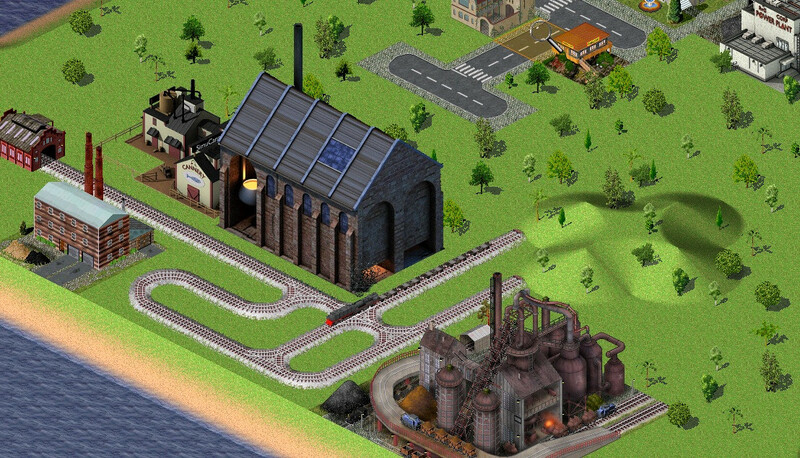 One option would be to make only the enrichment plants produce waste - not as realistic but doable. To speculate further, something I would personally like (but not viable for the main pak) is making modular designs with the player manually placing units next to each other. This way we could have multi-reactor facilities and perhaps a no cooling towers option for sea water cooled coastal plants. 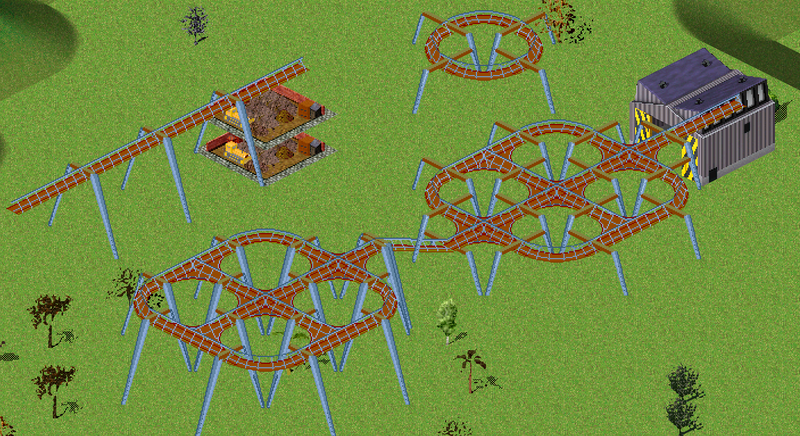 Then different units could make power and waste. A bit dodgy but lots of aesthetic appeal and customizing options. 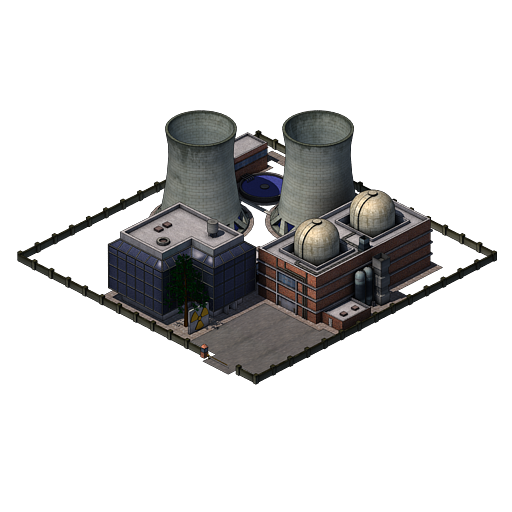 Maybe a power plant having a reactor coded as a field ? I thougt about that too but it wouldn't solve the waste issue, fields are still a part of the main factory. 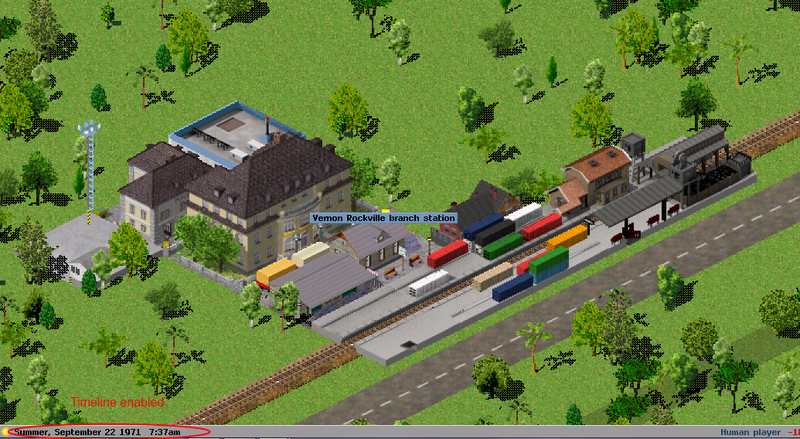 I wonder if we could have that for simutrans someday. Of course, it has nothing to do with that issue. That issue requires some coding to enable an industry to produce both electricity and goods. 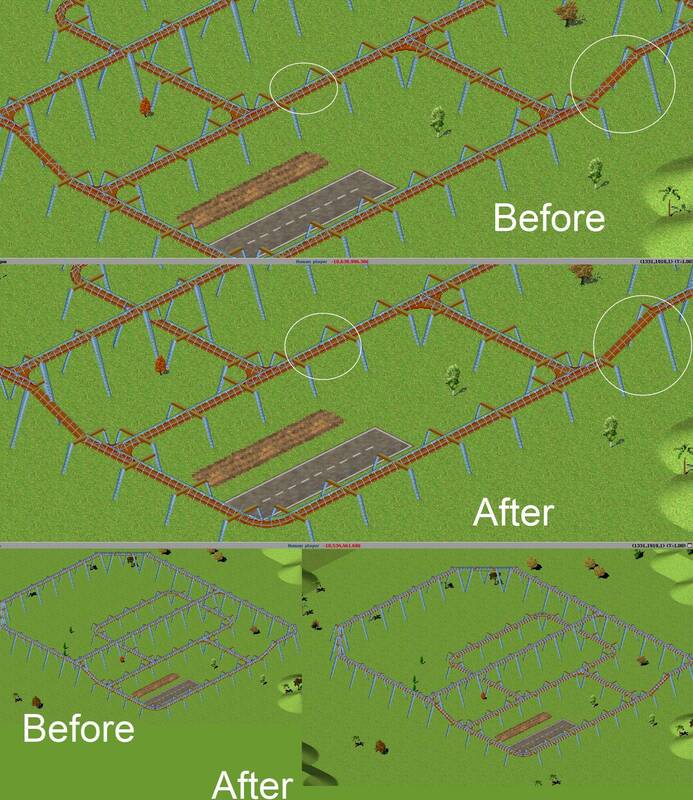 There is a solar power plant using the fields feature. Enrichment plant has a lot of waste - depleted uranium. That is of course the case but it would be strange if only a part of the chain produced waste - especially because the used fuel rods are the biggest problem in the waste issue. It wouldn't make much sense to maintain a deep geological repository just for depleted uranium, as DU is not only relatively harmless but has also practical uses. I would personally skip the waste aspect entirely... just as there isn't a waste product for coal power plants (fly ash that goes to a special landfill), which would produce far more by volume/weight than a nuclear power plant would. Even though handling radioactive waste is a big challenge, in terms of safe storage, it is not a big challenge in terms of transportation. The amount of fuel needed by nuclear power plants is very low, and so is the amount of waste. The biggest challenge in such transport is the construction of special cars, and safety mesures to keep terrorists and greenpeace out of the way. Neither of those fit in the scope of simutrans. 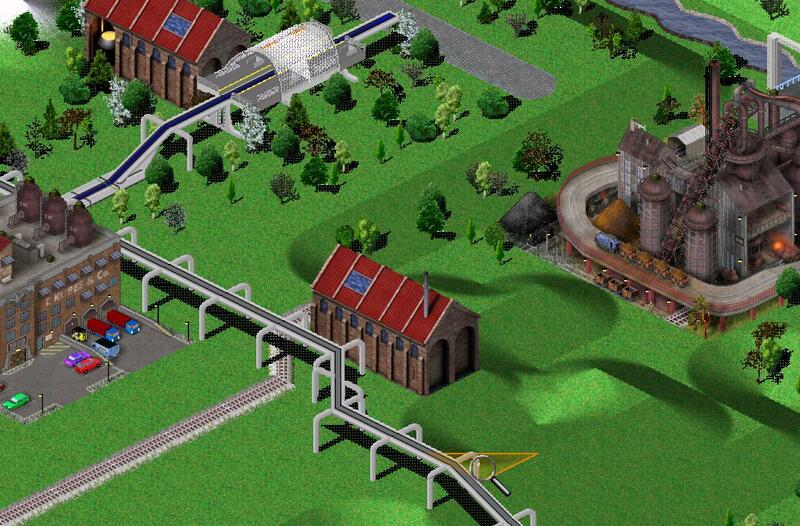 And simutrans is about transportation - so from the game point of view we can assume that the waste is stored in (or very close to) the power plant and no transport of the waste is needed. Adding some industry chains to use depleted uranium would be nice but not necessary. I agree that nuclear waste could very well be left out without the transportation finances changing dramatically. However a geological repository or a recycling facility is a bigger deal than a conventional dump and would be very rare. So radioactive waste could be implemented as something similar to printing ink, or medicines/chemicals in the old pak64 which spawned only one chemical factory and pharmacy for dozens of consumers. I think it could be an interesting challenge for the player to manage very long-distance transits which would have to be integrated into the existing roads and tracks. 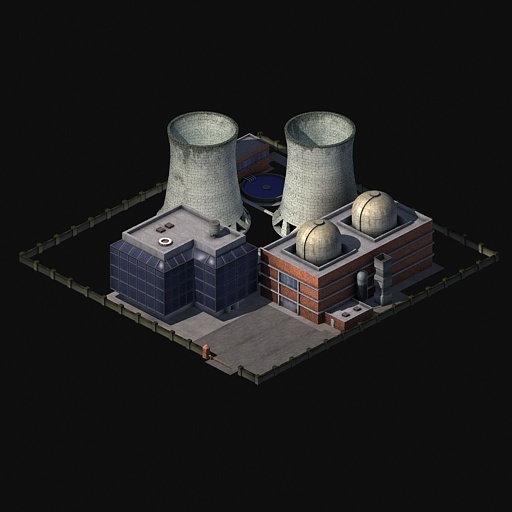 But I agree it isn't central to making nuclear plants in the game. 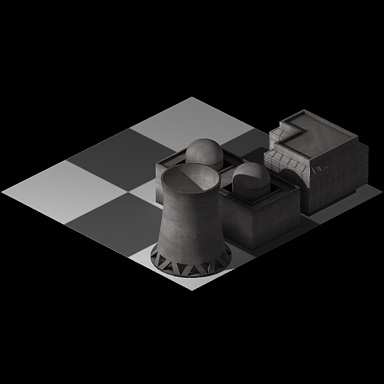 so from the game point of view we can assume that the waste is stored in (or very close to) the power plant and no transport of the waste is needed. Adding some industry chains to use depleted uranium would be nice but not necessary. 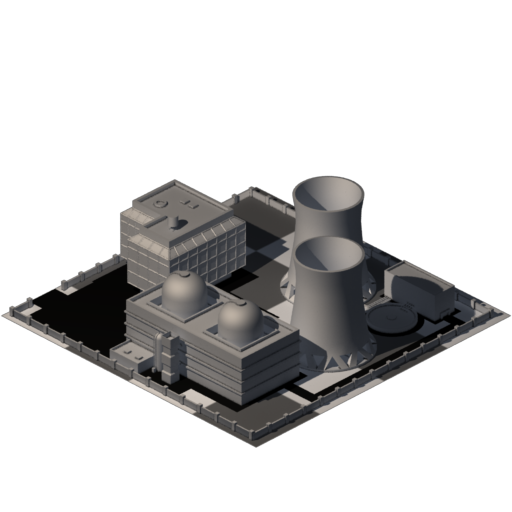 Nuclear plant is progressing slowly. 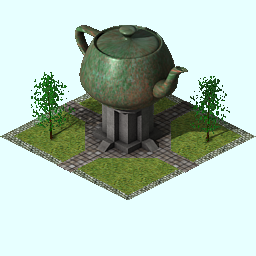 Added more roof junk, a tree and a trefoil slab. Ta-da! I'm not terribly happy with the fence (WAY too dark, thinking about removing it completely) and it has some dark outlining problem (also one of the rotations I forgot to un-mask. Oops) Otherwise it is pretty much done. 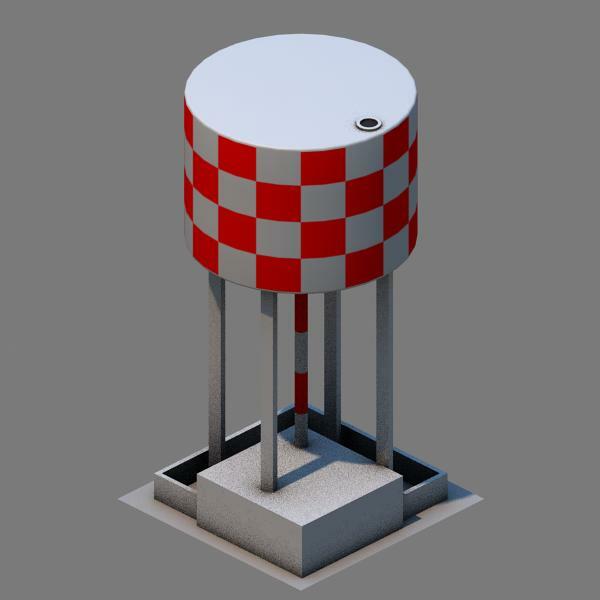 I'm moving to a new computer so there might be a downtime before I get 3dsmax running again, however I have all the rendered assets I need.